In the overflow cookbook cupboard in our kitchen, you’ll find a couple of worn and bulging tattered-paged spiral notebooks. They’re my “culinary journals”, full of scribbled recipes and clippings from magazines and newspapers, recipes I hope to try someday. This thin and crisp whole wheat pizza dough is one of those scribbles, dotted with oil stains and fingermarks, in a treasured, well-used notebook. In the old notebook the crust is topped with a simple homemade tomato sauce, sautéed mushrooms and mozzarella cheese. These days I’m more adventurous and like to top pizzas with basil pesto, chopped imported olives, and a variety of cheeses–smoked cheddar, fontina, goat or feta. Tomato sauce or pesto spread first is always a good way to go, but sometimes I brush the dough with nothing more than garlic and olive oil before sprinkling on any other topping. You might want to add sliced (or diced) fresh tomatoes, especially if they are warm off the vine. Try cubed eggplant sautéed in olive oil–yummy. Southwestern flavored pizza toppings, mild enchilada sauce, diced green chilies, Monterey Jack cheese and chopped cilantro are a fun variation too. Use restraint with the toppings–when a pizza is overloaded with goodies, the dough doesn’t bake as crisp. I always bake pizza on a pizza stone, which imitates a brick oven. The stone–an unglazed clay tile–goes in the oven 30 minutes before the pizza, so it’s very hot, and guarantees a crispy crust. Sprinkle a long-handled pizza peel with cornmeal, so the dough slides easily from assembly to the hot pizza stone. If you don’t have a pizza peel, use a rimless baking pan sprinkled with cornmeal. Pizza stones and pizza peels are nice tools to have, but don’t let want of equipment keep you from homemade pizza. All you need is a sprinkle of cornmeal on a baking pan–and you can assemble and bake the pizza right on the pan. Craving fun and fabulous pizza ideas? Try this one topped with arugula, mushrooms, goat cheese, and walnuts. 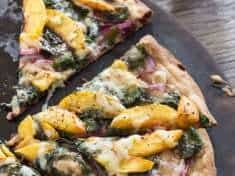 When peaches are at peak season, you must try this peach and arugula pizza. Wishing you a fabulous week–get in the kitchen and make pizza–with whole wheat pizza dough! This post contains Amazon affiliate links. If you purchase a product via my link, it doesn’t cost you anything and I earn a tiny commission, which helps defray the costs of Letty’s Kitchen blog. Thank you for supporting Letty’s Kitchen. 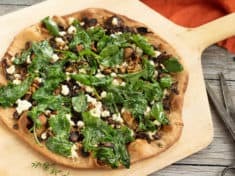 This whole wheat pizza dough has a wonderful nutty whole-grain flavor and a thin and crispy crust, a winning base for toppings of your choice. Makes 2 (12-inch) pizzas. 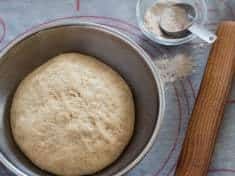 The dough mixing and the baking takes very little time, but plan on an hour to let the dough rise before rolling it out. Use that time to prep the toppings. 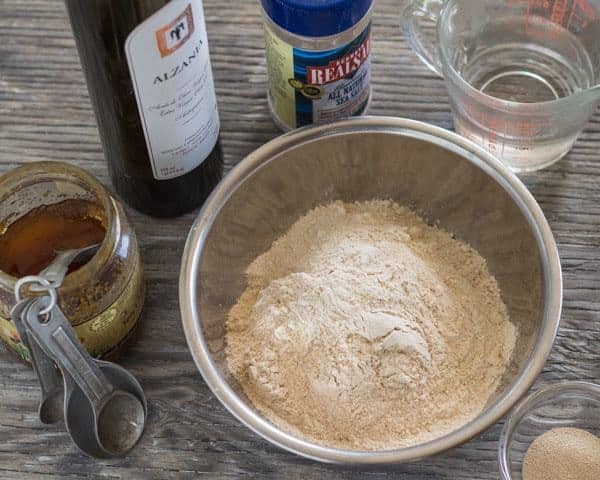 In the work bowl of a heavy-duty electric mixer, or in a large bowl, sprinkle the yeast over the warm water and honey, stirring to dissolve; let stand about 5 minutes. Add the olive oil, 1 ½ cups of the flour and the salt. Stir with a wooden spoon until it all comes together. 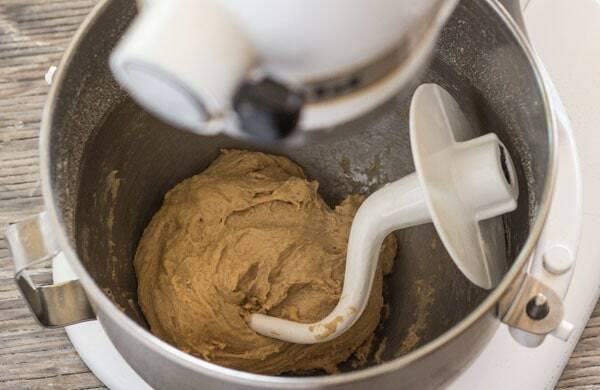 If using a machine, fit the bowl with a dough hook and knead on a low speed. Otherwise, turn the dough out onto a lightly floured surface and knead by hand. Knead 4 to 5 minutes, adding the remaining 1/4 cup of flour, and more, if necessary, until the dough is soft, smooth and elastic. Place in an oiled bowl at least twice the volume of the dough. Cover with plastic wrap and let rise at room temperature until doubled in size, about 1 hour. Preheat the oven and the pizza stone to 475°F. Gently fold the dough over and divide into 2 portions. Form each into a flattened round. 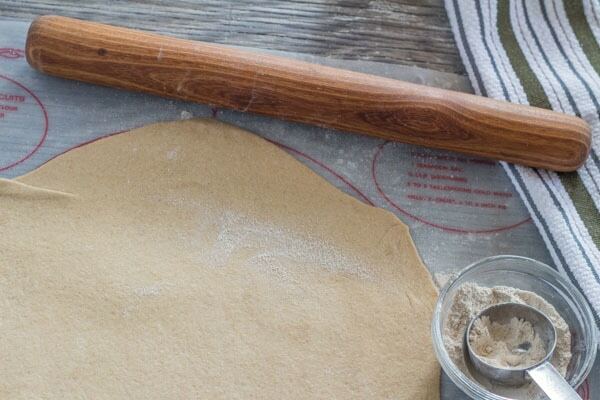 On a lightly floured surface using a rolling pin, roll one portion into a large round, about 13 inches. Place it on a wooden peel that has been sprinkled generously with cornmeal. Spread with tomato sauce and/or pesto, or brush generously with olive oil. Lightly top with some of the cheese and scatter your choice of toppings. Finish with more cheese and finally with Parmesan or Pecorino Romano. Slide the pizza onto the stone and bake 10 to 12 minutes, until the bottom is brown and the cheese looks nicely melted. Use the wooden peel to transfer the pizza from the oven to a serving plate. To serve, use a pizza wheel (or I use scissors) and cut into portions, about 8 wedges per pizza. Sprinkle more cornmeal on the wooden peel and make the second pizza. Gimme Lean is meatless veggie sausage. It tastes so much like meat sausage I once fooled my father-in-law!